Connected home provider Nest is expanding its offering as launches a new product designed to redefine what you come to expect out of appliances in your domicile. On sale this November, consumers can add the Nest Protect smoke detector to their homes for $129. In addition, the company is releasing version 4.0 of its app for Web, iOS, and Android and will be bringing its smoke and carbon monoxide detector to the UK starting in November. It’s been two years since Nest made its way onto the scene, competing against the likes of Honeywell. We spoke with the company’s Director of Product Marketing Maxime Veron to talk about how things have been going, its future with Protect, and more. When Nest launched in 2011, it had just 90 employees and its inaugural product was sold in only 3 retail shops with 50 certified retailers. Now, it has tripled its staff with teams in the UK and Taiwan, more than 5,200 retail stores, including Amazon, Lowes, Verizon, Target, The Home Depot in the US and Canada, and 10,000 certified installers. The Nest Protect follows the same design and development methodology that the company used on its thermostat. Veron tells us that it’s all about creating products that are the best in what they do. That’s what Nest believes it did with its first product and after that accomplishment, now it’s time to target the smoke detector. News about the Protect actually leaked out last month, although few details were available, but now we know more. Specifically, this device monitors for smoke and also carbon monoxide and also communicates to those in the home by telling them specifically where the problem is and warning them before the loud shrill of an alarm happens. What’s more, one need only wave their hand across the device in order to silence it — no longer must someone fan the detector. We’ve all experienced the smoke alarm going off while we’re cooking or searched for the source of that incessant low-battery chirp in the middle of the night. Every time a smoke alarm cries wolf, we trust it a little less, and then — in a moment of frustration — we rip the batteries out to stop the beeping. And that leaves us and our families at risk. Some interesting tidbits about the Nest Protect: it offers instructions in English, Spanish, and Canadian French. It offers a female voice, something Veron says will resonate better with children when it’s urgent (at least according to a Victoria University study). As is typical with Nest products, this new one also has a mobile component to it so that users can monitor what’s happening in their home. Notifications such as low-battery alerts, Heads Up (indicating that the device is sensing that smoke or carbon monoxide levels are rising), and emergency alarms can be received on your phone or iPad. In addition, the app includes a What to Do feature that reminds you of recommended actions and one-button access to emergency phone number. It’s also WiFi enabled, which means eventually you’ll be able to connect it with the thermostat and other Internet-supported devices. If you happen to have multiple detectors in your home (an average household has 3 to 4), Nest Protect can be wired together so that you can hear the alerts no matter where you are, even if the issue is isolated to one room. The Protect is powered through 6 AA batteries and Veron says there is one UK study that shows the batteries lasting for 5 years. A wired version can also be purchased with 3 backup batteries. You might also notice that the shape of Nest Protect is different from the company’s thermostat product — was it done deliberately? Veron tells us that a lot of work went into the square design of the product and it was made to look like something you hopefully will love and know that it will feel safe. Traditional smoke and carbon monoxide detectors are circular and probably have a stale vibe to them. With a square-shaped device, perhaps the household will feel more comfortable around it. But how does the Nest Protect work at night? Through the use of its light and activity sensors, it uses its LED lights to illuminate your path as you walk underneath it. Additionally, when you go to sleep, it will show a quick green glow after the lights go off to let you know that the device is working. In early 2014, Nest says that its Protect device will be compatible with wired security systems. As alluded to earlier, Nest Protect is available in two versions: wired (120V) and battery-powered. It can be purchased in either white or black. It will be available for a retail price of $129 and sold via Amazon, Apple, Best Buy, and The Home Depot. It’s also awaiting certification from US, Canadian, and European regulators. 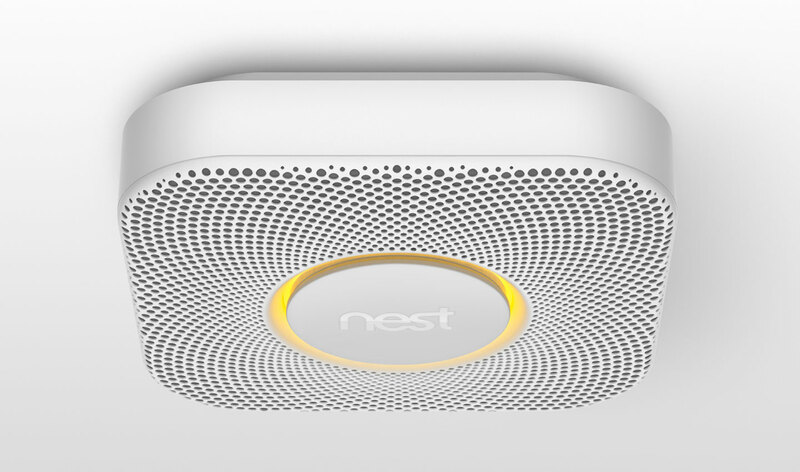 Also released with the new Nest Protect is an updated iOS, Android and Web application. Today, it has been rebuilt with a new design and features to accommodate the growing line of products. Until today, Nest’s offering had only been available in the US and Canada. Starting in November, the Nest Protect will be available for purchase at Apple, Amazon.co.uk, and John Lewis outlets for £109. Like it’s counterparts, the UK iteration of the Protect will be available in two versions — wired (230V) and battery-powered. More information will be on the company’s UK website.